I don't pretend to be a Photoshop master, but I know my way around the program pretty well. Well enough that a surprising amount of people have asked me to add a "Lightsaber," effect to one of their photos. 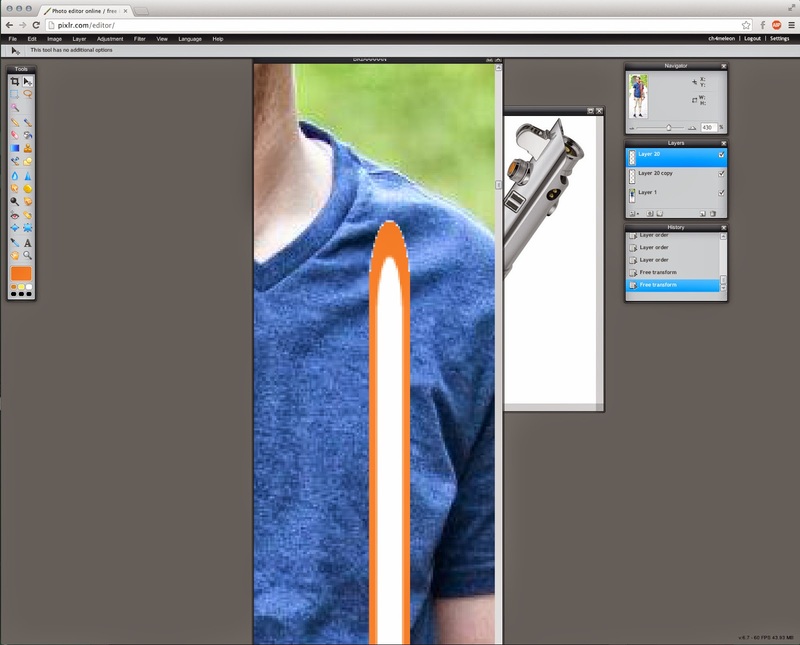 A quick search online will reveal many different approaches to creating realistic looking lightsabers within Photoshop. It's very easy to be honest. Only, Photoshop isn't exactly within a lot of people's budgets. GIMP is a free alternative to Photoshop that you can download online, and there are even some tutorials online to create a lightsaber using GIMP. There's actually a third alternative to Photoshop however. It's also free (similar to GIMP) but it doesn't require you to download anything! It's called Pixlr (maybe you've heard of it?). You can use it on your phone or on any computer. 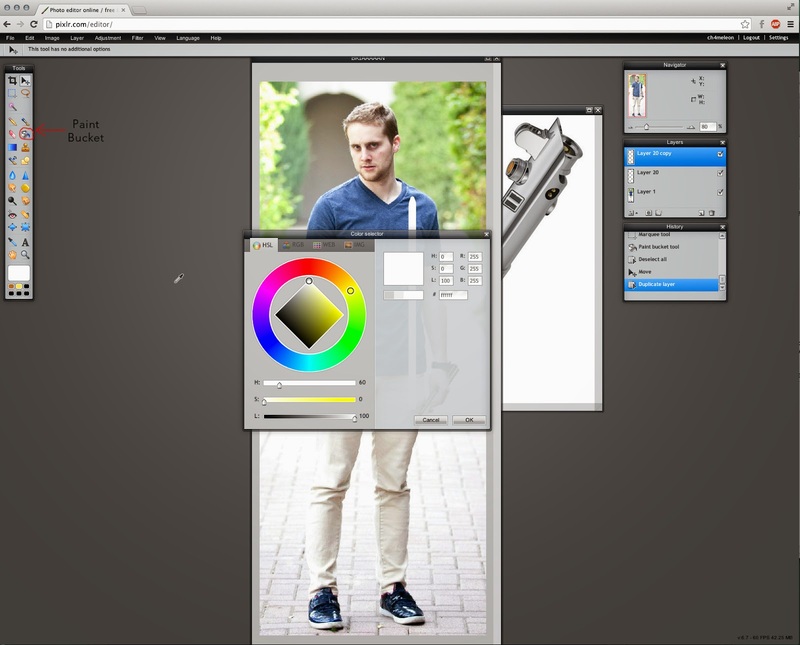 It runs within your browser and operates very similar to Photoshop (albeit on a much simpler level). While it definitely isn't as sophisticated Photoshop or GIMP, you can use Pixlr to create a lightsaber effect. I couldn't find any tutorials online about it, so I thought I'd make one right here. Again, I'm no Pixlr expert, but my methods certainly get the job done, and for those who don't want to download anything or can't afford photoshop, then this may just be the guide you're looking for. 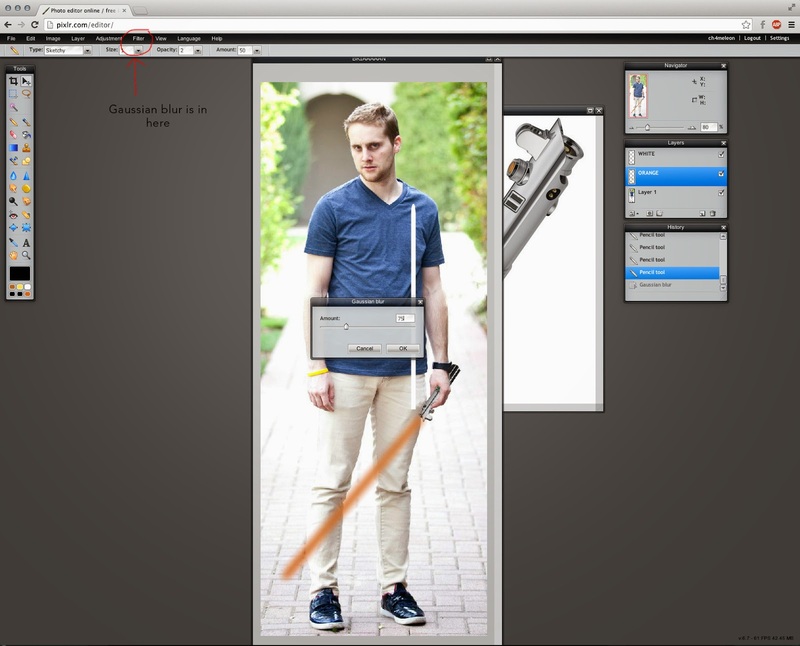 For my image, I took an image of myself I just had on file and crudely threw a lightsaber in my hand. The button sort of looks like a piece of paper that's been folded in the corner. Click that to create a new layer. On the far left you should see all of your tools. The dotted-line box and lasso tool are your basic selection tools. You can use these tools to create the basic shape of a lightsaber. The shape you create can be moved later, so don't worry about it's placement just yet. I first made a long rectangle and then used the lasso tool to add a point (make sure to hold SHIFT when you are adding to a selection). It may help in getting the perfect lightsaber point to zoom in on your selection using the "Zoom," tool. 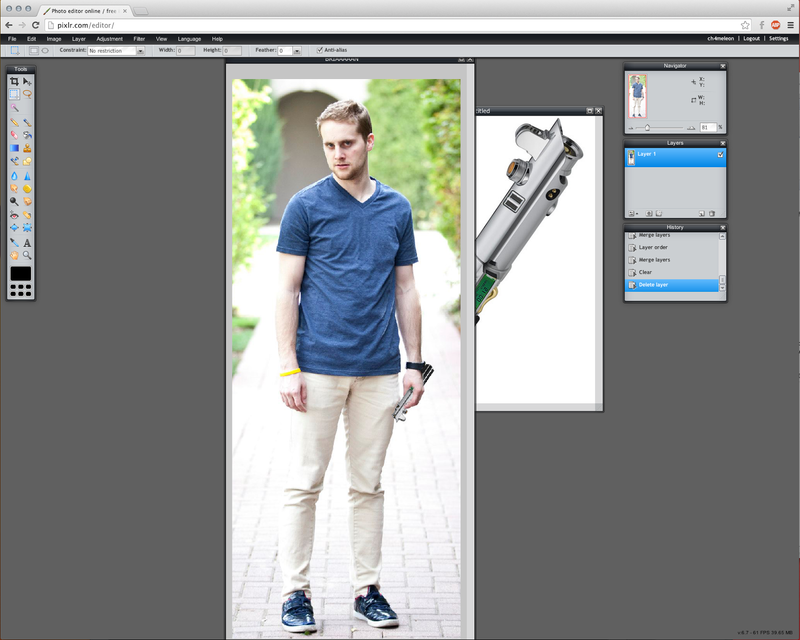 STEP FOUR: Use the "Fill Tool," to make your selection white. 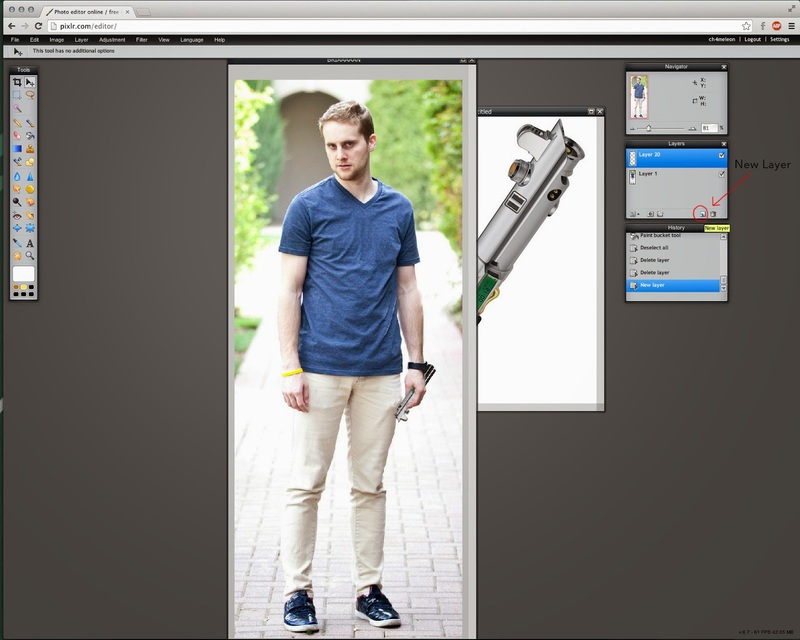 The "Fill Tool," or "Paint Bucket," tool is available on the far left. After making sure you have the right color selected, click inside of your selection and it will all become white! You can then move your newly created white object around however you like. I moved mine over to the right so I could see the color better. Over on the right you have your "Layers," panel. Use this panel to duplicate the layer that has your white lightsaber shape in it. 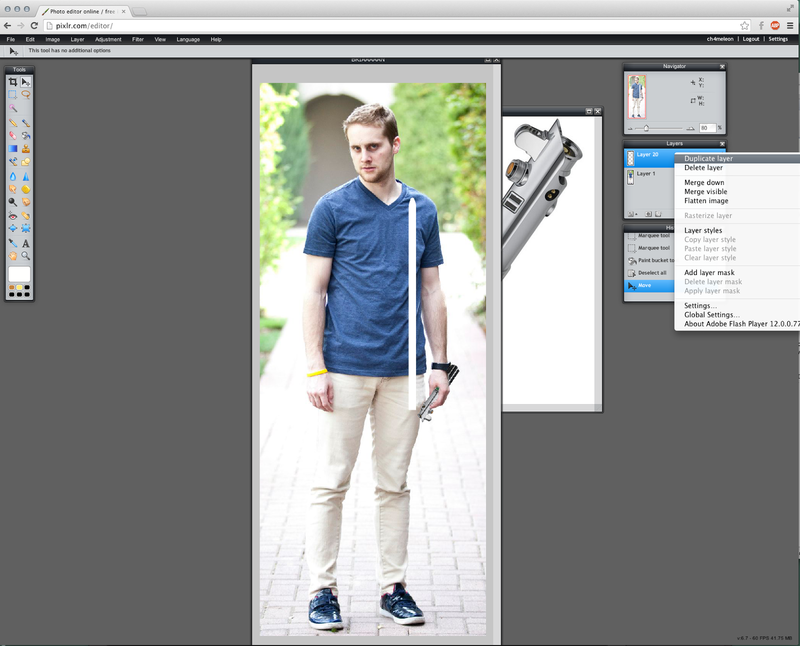 You can do this by right-clicking on the layer itself and selecting duplicate layer. STEP SIX: Choose your lightsaber color! On your new layer (which should read something like "Layer 2 Copy,") use the same Paint Bucket or "Fill," tool from before to change it's color. This will be the color of your lightsaber so choose wisely! I chose a bronze-orange for my lightsaber. If you're worried about confusing the two layers, you may want to consider renaming them "White," and "Color," respectively. Once you've colored over your duplicated layer, you'll want to move that layer below your white layer. Remember the Layer panel on the right? 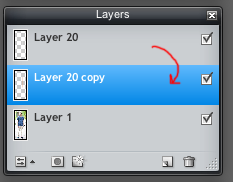 Go over to that, click and drag the copied layer so that it appears beneath the original layer (see image). Now that the colored portion is on the bottom, reselect the white layer of the lightsaber (this is very important). Once you're sure you have the white portion selected (the layer that doesn't say "copy,") go over to Edit (at the top) and select "Free Transform." Alternatively, you can push CTRL + SHIFT + T though this doesn't always work with Pixlr. You'll notice that there are blue boxes around your lightsaber now. Use these boxes to shrink the white portion of your lightsaber. Bring the sides of the lightsaber in slightly and reduce it's length slightly. If you make a mistake you can "Undo," it with CTRL + Z, so don't feel too much pressure. 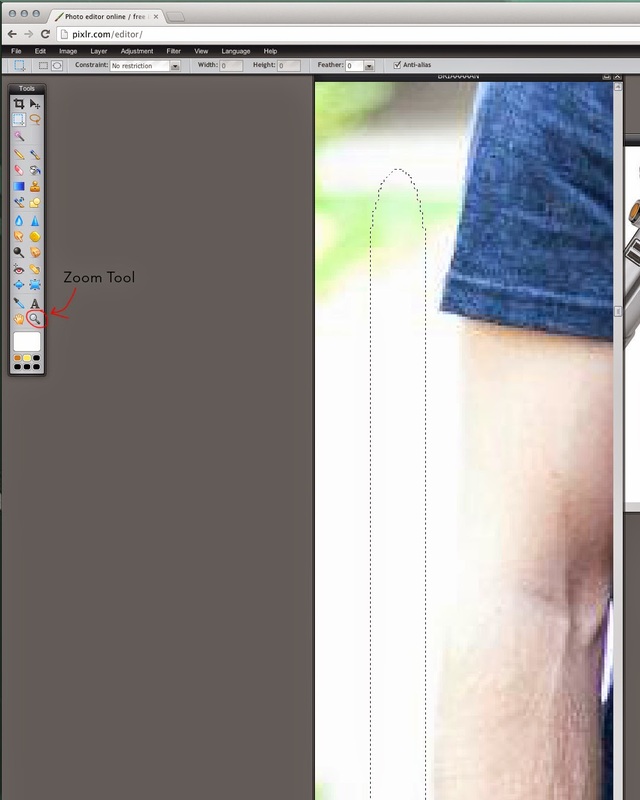 It also may help to zoom in using the zoom tool from before. When you are done you can hit "Enter," or click anywhere on the screen to make the Transformation changes permanent. Here's how mine looked when I finished making changes. Once you've resized the white part of your saber and it looks smashing, take the colored layer and move it to wherever you want the lightsaber blade to appear. You will have to use the "Free Transform," from before to rotate and move the blade. Anyways, select your colored layer and use the pencil layer to draw small lines in each corner of the picture. If the opacity is set to 1 or 2 you won't even be able to see them and this essentially gives your colored layer a canvas size of the entire picture, instead of a small box around it. I know it's confusing, but just do it. Small tiny lines in each corner of the picture. Do it! The secret behind every lightsaber is the Gaussian Blur. Double check and make sure that your colored portion is selected, then hit "Filter," at the top and select "Gaussian Blur." You can experiment with the degree of the blur, but I went with 75 and it turned out well. You're on the last step now. It's simple really. Just grab the white layer and (using the Free Transform tool we're so fond of) move and rotate the lightsaber until it lines up with your colored layer. They don't let you move two layers at once (at least, not that I could figure out) otherwise you could have moved them together before. But with a little bit of time you should be able to line them up perfectly. And Viola! Can you believe it? Now it looks like I'm holding a bronze-orange lightsaber. How absolutely ravishing. Once you're done you can click "File," up above and save your creation straight to your computer. If you had any problems feel free to shoot me a question in the comments below and I will try and coach you through any issues. Or, if you want to share your creation with me, please do so in the comments below! Thanks and I hope this was helpful. Hmm that's very strange. I'm not sure what the issue is, but you might try creating the lightsaber in a completely separate document and then importing it in after? Other than that, I would recommend just a hard reset of the Pixlr web client. If something is going janky, just restart and try again. It's worked for me before. Nice tutorial. Here you can learn how to make colors brighter or darker. Here is the website softwarehdr.com/ . He advised me dear people in this area. I hope you will help this tutorial. With a camera in each hand today, similar to a little spending plan digicam or an advanced cell, people are snapping more photographs than any time in recent memory http://www.bestphotoeditingsoftware.org/.